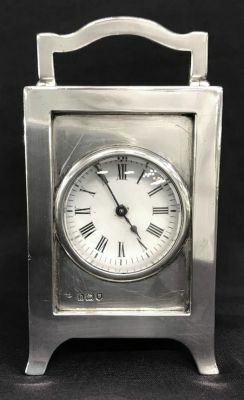 Arts & Crafts sterling silver cased carriage clock. English hallmarks for London 1903. The case is made by William Comyns & Sons Ltd., Beak St., London. The clock mechanism is stamped French Movement. The overall frame rises from a flared foot. The top and sides have three dimensional panels of irises in bloom. 2” by 1 3/4” at the base, 3 1/2” high at the top of the handle.